Since most of the increase in the federal deficit is due to bailing out the banks and salvaging the greater economy they helped destroy, why is the top investment bank doing so well? 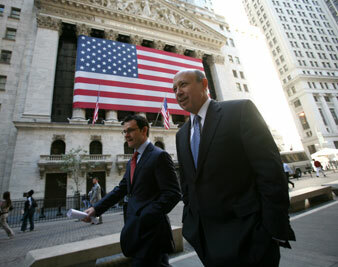 Lloyd Blankfein, right, CEO of Goldman Sachs, leaves the New York Stock Exchange after attending a panel discussion. Connect the dots: Goldman Sachs made $3.44 billion in profit this past quarter, while the US deficit topped $1 trillion for the first time in the nation’s history and appeared to be headed toward doubling that figure before the budget year is out. Since most of the increase in the federal deficit is due to bailing out the banks and salvaging the greater economy they helped destroy, why is the top investment bank doing so well? Well, because that was the plan, as devised by Bush Treasury Secretary Henry Paulson, a former CEO of Goldman Sachs. Remember that Lehman Brothers, Goldman’s competitor, was allowed to go bankrupt. The Paulson crowd wouldn’t let Lehman change its status to that of a bank holding company and thus qualify for federal funds; soon afterward, Goldman was granted just such a deal, worth a quick $10 billion. Much is now made of Goldman paying back part of its bailout money, but forgotten is the $12.9 billion that Goldman got as its cut of the $180 billion AIG payoff. That is money that will not be paid back. Goldman is considered a very smart bank because it was early in reducing its exposure to the mortgage derivatives that in large part caused the meltdown. However, it had done much to expand the market and continued to sell suspect derivatives to unwary buyers as sound investments, even as Goldman divested. The firm still holds $1.85 billion in real estate and lost $499 million in the previous quarter on bad loans, but made up for it by playing the vulture role and issuing high-interest debt to governments and companies made desperate by the recession that the financial gimmicks of the banks brought on in the first place. Big bets made in a casino designed by Goldman, which now makes money off loans to the victims. High on the list of victims are state governments that have to turn to Goldman for money because the federal government that saved the banks won’t do the same for the states, which have watched their tax bases shrink because of the banking meltdown. As the WSJ noted, “issuing debt to ailing governments” is now a growth industry for Goldman. Why didn’t the federal government just lend the money to the states? Why was all the money thrown at Wall Street instead of needy homeowners or struggling school systems? Because the federal government works for Goldman and not for us. Indeed, when it comes to the banking bailout, Goldman Sachs is the government. One of those stars was Stephen Friedman, another former head of Goldman. Friedman was both a director of the company and chairman of the New York Federal Reserve Bank when he helped work out the details of the Wall Street bailout. The president of the NY Fed at the time, Timothy Geithner, now secretary of the treasury, requested a conflict-of-interest waiver that allowed Friedman to buy more Goldman Sachs stock, and Friedman ended up with 98,600 shares. At market close on Tuesday that was worth $14,756,476. That’s nothing–three years ago, the fifty top Goldman execs made $20 million each, and this year could be better.